We look forward to seeing you at the 18th annual Susan G. Komen Puget Sound Lunch for the Cure! Co-host of MOViN 92.5’s “Brooke and Jubal in the Morning,” Brooke is a longtime Komen volunteer, advocate and fundraiser. 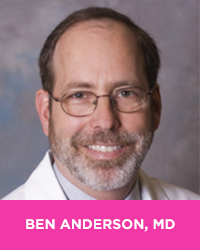 Dr. Ben Anderson of the Seattle Cancer Care Alliance and Fred Hutchinson Cancer Research Center is a Komen Scholar, funded for his research to address breast cancer disparities around the globe. Discounted event parking is available at the Hotel Murano Parking Garage for $5, cash only (regular rates apply if you pay by credit card). Parking at the hotel is limited; be sure to arrive on time for best availability. Consider carpooling, taking the light rail or using a rideshare service like Lyft or Uber for transportation. From the parking garage, proceed through the entrance of the hotel and take the stairs or the elevator to the fourth floor. Take the nearby doors leading through the outdoor courtyard to the Bicentennial Pavilion — just look for the giant pink ribbon! Business formal. In the spirit of the occasion, don’t forget to wear PINK! We look forward to seeing you at Lunch for the Cure! To learn more about becoming a Lunch for the Cure sponsor contact us at 206-633-0303.